The change in gas landscape in Europe is driven by both economic and political factors. The political confront with Russia, after the annexation of Crimea, forced the European Union (EU) Commission and some member-states to seek for alternate resources and transit routes of natural gas. The still-high prices of Liquefied Natural Gas (LNG) and the existing projects of European Southern Corridor put the lights over the South-Eastern flank, Caucasus and East Mediterranean. The recent gas discoveries near Israel and Cyprus are, in this perspective, an opportunity for strengthening the links between EU and Middle-East countries and, also, to enhance the political stability of the region. Nevertheless, there is the need of a country that could be the center of the axis between Europe – and also the Balkan region – and the Eastern Mediterranean countries, especially in terms of transit infrastructure. In this perspective we have to explore the actual and future role of Greece in the Mediterranean as a potential gas hub for Europe and the Balkan region. Aside from the demand and supply balance, evolving with the energy transitions all over the continent, there is also the need of an access to the new gas resources of the Mediterranean. But in this prospective hub position, Greece is being challenged by Turkey as the hub position could give an important geopolitical power. For years Europe is experiencing a global decrease in natural gas consumption. EU countries accounted for 428.8 Billion cubic meters (Bcm) in 2016 in comparison with 490in 2005. Currently the EU countries consumption in natural gas is decreasing at a 2.2% yearly. Due to energy transition policies, in touch with the EU Climate-Energy packages, the need for fossil fuels is expected to continue to diminish in the next years, even with an acceleration of the decrease. In the same time, the EU countries also experienced an important decrease in natural gas production from 201.9 Bcm in 2005 to 118.2 Bcm in 2016. 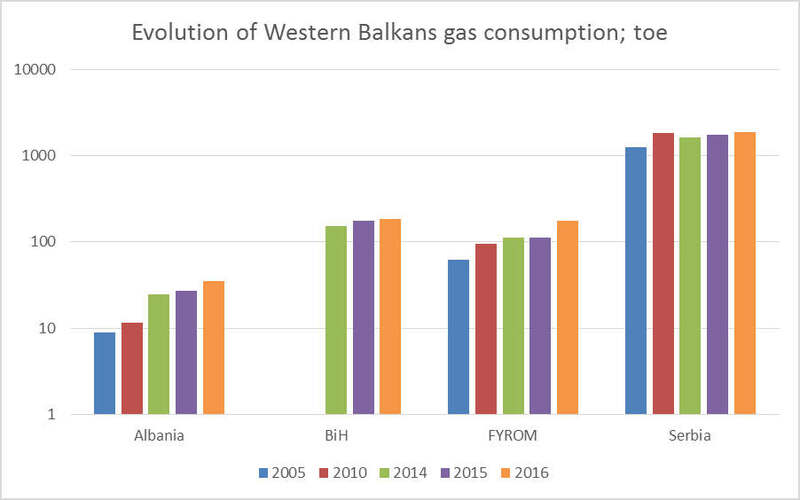 Figure 1: Evolution of gas consumption in the Western Balkans; source: Eurostat. According to those figures, the EU seems to decrease its dependency to natural gas as the most important energy source for the production of electricity. Over the figures, the most important element to be assessed is the gap between the EU production and the EU consumption. Of course there is a global decrease in gas consumption but with a -2.2% yearly, far away from the decrease in production (-5.5% annual rate). The result of this difference in pace is the need to increase the volume of gas imported from outside the EU. In the coming years this trend is going to become more and more important with the foreseeable exhaustion of the traditional gas fields in Northern Sea (UK, Netherlands, and Norway). In the same time, the non-EU Balkan countries are, contrarily to EU countries, going to have a global increase in their gas consumption. All of those countries are member of the Energy community through the Energy Community of South-East Europe (ECSEE) treaty signed in 2005. Regarding this treaty, Albania, Bosnia and Herzegovina, Former Yugoslavian Republic of Macedonia, Kosovo, Montenegro and Serbia agreed to implement regulations similar to the EU Climate-Energy packages, in order to achieve a community in their national energy sector and the EU regulations. Considering the obligations in the 2014 package (40% reduction of greenhouse gases (GHG) emissions on the 1990 basis, 27% renewable energies in the mix, 27% level of energy efficiency), the Western Balkan countries are forced to operate an immediate switch from their coal-based electric mix towards a less-polluting basis.Not all the Western Balkan countries are having coal as their electric mix basis – Albania is 94% hydropower – but all of them make an extensive use of coal or at least of diesel, with an important impact on their GHG emissions and, most important, a large part of them made a domestic use of gas (heating, cooking, etc.). So for them gas is, naturally, the most interesting source of energy due to its affordability, availability and ability to be used in large power plants. As a result, nearly all the Western Balkans countries experienced an increase in their natural gas consumption.Kosovo and Montenegro don’t have an access to natural gas for the moment. Aside from this economic perspective on natural gas demand, the EU Commission pointed in 2008 the risk of a critical geo-economical dependency to Russia in oil and gas. The gas pipelines architecture in Europe remains – especially in the Eastern part of the Union – the legacy of the Cold War era. The uttermost dependency to the Russian-managed network running from Central Asia-Russia area gave Moscow the upper hand over Europe’s supplies from the 1980s. After the eve of the golden age of gas and the so called “gas wars” between Russia and Ukraine (2006-2009), the European Commission decided to promote an alternate way to Central Asia and Middle East gas resources. The package called “European Southern Corridor” intended to develop 3 new ways from East to West, mostly through the Black Sea area. All of those projects are being financed by the EU through the Project of Common Interest (PCI) mechanism. 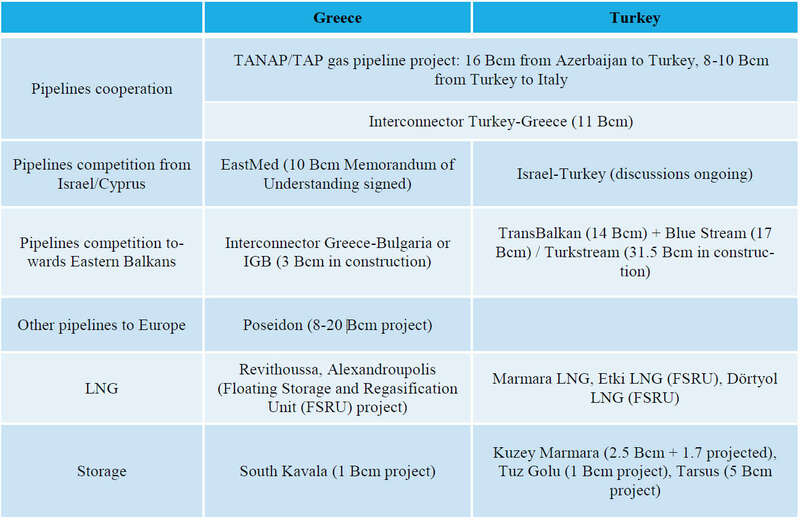 These pipelines projects encountered several issues and transformations over the years to the present situation: a pipeline to connect Turkey, Greece and Italy (Interconnector Turkey-Greece-Italy or ITGI); a pipeline to connect Georgia to Romania (White Stream); and the most important, a double pipeline running from Azerbaijan to Turkey (Trans-Anatolian Pipeline or TANAP) and then from Turkey to Italy through Greece and Albania (Trans-Adriatic Pipeline or TAP). White Stream is now delayed with the annexation of Crimea.The White Stream project was supposed to run through the territorial waters of Ukraine in Crimea. TANAP/TAP remains the most important and strategic of those projects despite its small size (16 Bcm/year for TANAP and 8-10 Bcm/year for TAP initial stage). This leads to the construction of a new network adding pipelines to an existing system around the Black Sea to create a new intertwined system where Russia could remain the most important supplier but not the sole one. 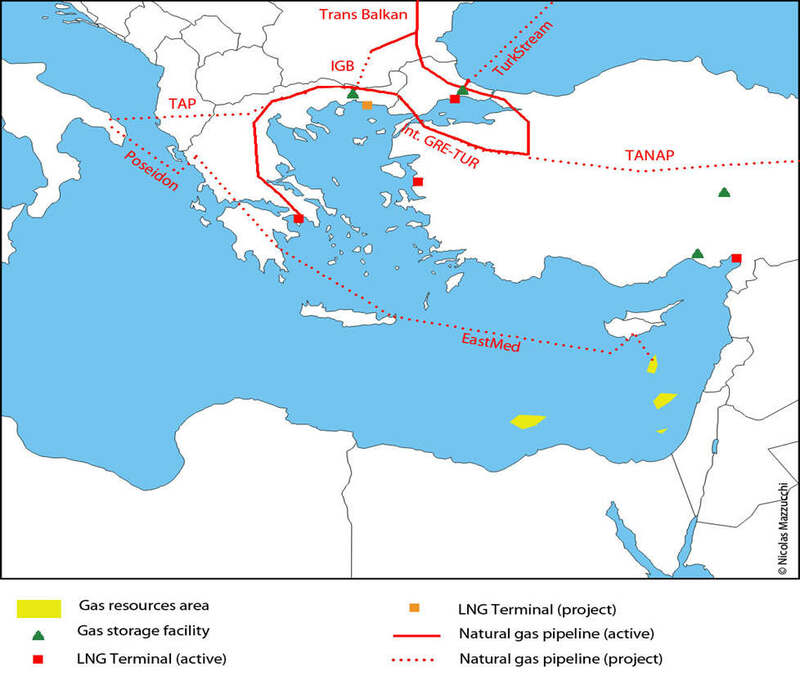 Greece and Turkey are at the center of this new network are, therefore, becoming competitors for the role of gas hub. To support those tubes, there is also the need of creating a global hub consisting also in storage capacities and alternate supply in LNG. The aim is to stabilize gas supplies and prices in order to avoid turmoil or breakouts. The need in storage capacities in the whole European area leads to the development of facilities in South-East Europe and also in Turkey. Moreover, the gas supply issue from sources outside Russia though the Southern way is not limited to the European Southern Corridor pipelines. The 2008 EU project was centered around well-known resources of Azerbaijan – but also Turkmenistan and Iran – and didn’t take into account the potential discoveries of major gas resources. Since 2010, the success in exploration of new gas fields in the Eastern Mediterranean is leading to an evolution of the importance of the region in gas geo-economics. Israel policy in exploration-production, giving concession to junior gas companies, transformed the country’s orientation towards gas. Historically a gas net importer, Israel is at the verge to become a gas exporter. The discovery of the Tamar field (200 Bcm) in 2009 and the Leviathan field (470-621 Bcm) in 2010 opened new perspectives for the little consuming country (9.7 Bcm in 2016). In the following years, the Italian company ENI discovered in 2015 the Zohr gas field (850 Bcm) and Cyprus issued permits for drilling in its Economic Exclusive Zone (EEZ), leading to the discovery of the Aphrodite gas field (200 Bcm) in 2011. Those new gas resources in the Eastern Mediterranean area are focusing the interests of both European countries and Western gas companies to produce gas from those fields and to explore further in the EEZs of the Levantine basin. Except from Zohr, discovered by the oil & gas major ENI, most of those discoveries has been made by junior companies: Noble (Aphrodite, Tamar, Leviathan) and Delek (Tamar, Leviathan). They acquired specific know-how on the region that help them to provide technical assistance to major oil & gas companies on the new Exploration and Production (E&P) blocks. Figure 2: Gas reserves/consumption ratio in years; BP, EIA, author's estimate. The exploration is ongoing on the region as several countries are interested in the Levantine basin. Israel and, mostly, Cyprus are following up their exploration policies with exploration blocks awarded to major oil & gas companies (Total, ExxonMobil, ENI, etc.). Cyprus’ third round of awards led to the creation of three new blocks (6,8 and 10) in 2016 with a total of 13 blocks. The promising discoveries of new fields (e.g. Daniel East and West) gave a positive signal on East Mediterranean resources as the new gas frontier in Middle-East. Lebanon also awarded 2 E&P blocks to Total, ENI and Novatek in order to benefit from geological conditions similar to Israel and Cyprus. Nevertheless, all of those E&P permits raised concerns about the non-settled disputes between countries over their borders. The issue of EEZ delimitation in the Levantine basin, especially around Israel has been refueled by the gas discoveries. Lebanon and Israel have engaged a dispute over the delimitation of their EEZ. The relations between Israel and neighboring countries but also between Cyprus and Turkey could lead to geopolitical active struggle as a drilling ship from the Italian company ENI has been intercepted by the Turkish navy on February 2018 close to the Block 3. The militarization of the Levantine basin, with the increase in volume and capabilities of the Turkish navy and the Israeli navy could fuel the tensions over E&P blocks, consisting in an “upstream struggle”. 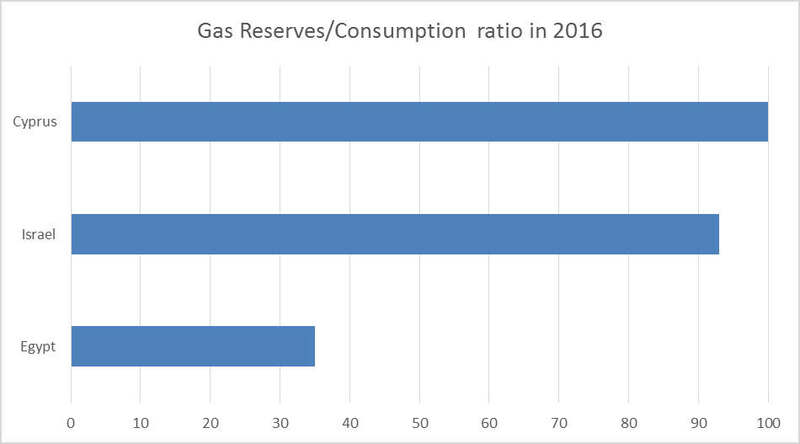 Most of Levantine countries are little (Israel) or no (Cyprus) consumers of natural gas, so their reserves could be used for both exportation or national energy transitions. Due to little national energy demand, except for Egypt, they mostly seek to put in place policies and infrastructures for exporting their gas. For them two destinations could be considered as gas exporters. First of all, the neighboring countries and secondly the closest large consuming market: the EU. Israel signed a supply contract with Jordan in September 2016 and then with Egypt in February 2018 but the latest is intended to be used mostly before the full exploitation of Zohr. Those local markets could ne be considered as a priority and, consequently, they have to look at European markets. In order to do so, they need to develop dedicated infrastructures whether pipelines or LNG terminals. Egypt is having two LNG terminals for exportations with limited use as the country’s exportation significantly decreased at the end of the 2000s. With the agreement between Tel Aviv and Cairo, those terminals could be used to export Israeli gas but that would lead to a dependence of Israel to Egypt. As the richest country in gas, Israel is looking to several exportation ways and is, therefore, being courted by several countries, especially Greece and Turkey. Aside from the “upstream struggle” there is another geo-economic struggle in the Eastern Mediterranean area, the “midstream struggle” for the transit. The role of Greece is major there as the country is benefiting from the support of EU, inside the European Southern Corridor. With the “upstream struggle” between Cyprus (also Israel) and Turkey, Greece is having an important geopolitical asset to play. Central country between the Western Balkans and Minor Asia, Turkey became the center of Europe-Asia energy bridge. At the 2016 World Energy Congress held in Istanbul, the Turkish executive installed themselves as key players over Europe’s gas supplies. The Congress saw the signature of the Turkstream agreement with Russia and the invitation of Turkish republic of northern Cyprus, Azerbaijan and Russia’s presidents were strong signals of Ankara’s will to become the key player of the region. Aside from this pipeline linking Russia and the TransBalkan pipeline in Western Turkey and the ongoing TANAP pipeline from Azerbaijan, Turkey is also investing in two key elements: LNG and storage capacities. 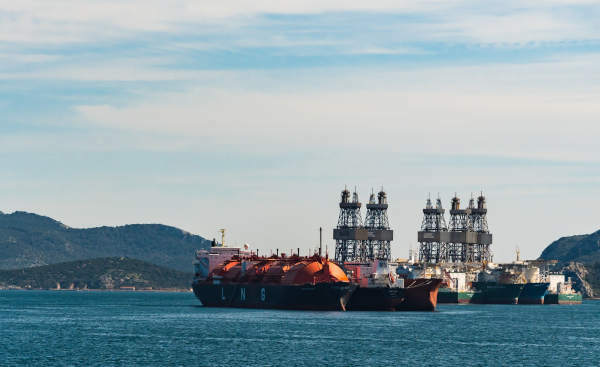 Two new LNG terminals have been commissioned in the last years to be able to provide natural gas from Algeria and Qatar to the Turkish and European markets. In the same time there are several projects to dramatically expand the country’s storage capacities, notably in Anatolia. Greece on its side is following the same strategy with a cooperation signed in 2017 to provide Russian gas to Italy through a new Poseidon pipeline under the Adriatic. Athens is also a key player in the TAP project even without Greek companies involved in the BP-SOCAR-led TAP consortium (SOCAR, BP, Fluxys, Snam, Enagas, Axpo). Moreover, Greece have also LNG projects financed through the EU PCI mechanism, the extension of the existing Revithoussa terminal near Athens and the new Northern Alexandroupolis terminal.The EU gave Greece a very important backing through the PCI as at the end of January 2018, 6 projects are on the list: Interconnector Greece-Bulgaria, EastMed pipeline, LNG terminal of Alexandroupolis, TANAP-TAP, Poseidon pipeline, Kavala storage facility. They are supposed to constitute the heart of the new Greek gas network. Those regasification capacities would also provide the ability to import gas from Middle East and African countries. Alongside the LNG terminals, Greece has also a storage project financed by EU funds at South Kavala, even if this is one (1 Bcm capacity) is limited in comparison with Turkey (near 10 Bcm capacity in project). The two key elements of a gas hub, namely the diversification in transit routes and modes, and the ability to store gas in order to regulate prices and fluxes, are being developed in both countries. Greece infrastructures are smaller in size than Turkish’s but due to the country’s limited needs in domestic consumption (Turkey consumed 42 Bcm in 2016 and Greece 2.8 Bcm), they could be sufficient for regulating the gas fluxes towards Europe and the Balkans. The main difference relies in the pipelines projects towards Eastern Mediterranean resources. The good relations between Greece, Cyprus and Israel led to the signature of an agreement to build a new pipeline, namely the EastMed, in December 2017. The final investment decision could be issued in early 2019, with the support of Italy added to Greece, Cyprus and Israel. The economic consortium to build the EastMed and also the Poseidon between Greece and Italy, involves the Greek national company DEPA with the EDF Italian subsidiary Edison. The construction of both Poseidon and EastMed would be, for Greece, a cornerstone in the “gas hub” strategy with an important diversification of resources and the direct link between Greece, the resources and the final customer, contrarily to the TAP project. Besides their competition, Greece and Turkey are also engaged in a cooperation for the TANAP/TAP pipeline and the interconnector Turkey-Greece. The global coopetition between the two countries is at the center of the region’s economic and political dynamic. The coopetition dynamics is very complicated as the two countries are having different political orientations and affiliations. Nevertheless, there are a large number of geopolitical common points between Greece and Turkey. Both remain close to Russia and rely on Russian gas supplies for their own energy sector. Turkey receives the two-thirds of its gas from the Blue Stream pipeline and Greece has a long-term agreement with Gazprom until 2026. Both countries are also, through TANAP/TAP pipelines linked to the Azerbaijan company SOCAR. Globally both countries made the choice of the diversification in suppliers and projects. First of all, in geography with a double orientation towards Caucasus-Central Asia (TANAP/TAP) and East Mediterranean; then economically with a participation to European projects and, in the same time, important links with Russia. Their choice to build LNG terminals is also a matter of potential diversification of suppliers in terms of national security of supplies and continuity of transit towards Western European consuming markets. So, for Greece and Turkey there could not be a direct confront over pipelines issues and the East Mediterranean resources as such a struggle could lead to a delay or a cancelation of European funded pipelines. Neither could rely on an important oil and gas company able to finance important infrastructure projects. They are forced to seek partnerships from either the producing or the consuming side. Nevertheless, Greece could benefit from the geopolitical disputes on the East Mediterranean maritime territories where Turkey is involved. The issue of maritime boundaries of Cyprus, in touch with the gas exploration issue, and the up-and-down relationship between Turkey and Israel – over the Gaza issue – fuel tensions between Ankara and the other countries. Moreover, the development of the Turkish navy and the military intervention of Turkish forces in Syria raise concerns over the ambitions of R. T. Erdogan over the Middle East region, especially in Western Europe. Gas producing countries of East Mediterranean could seek for another partner in transit as Turkey could be accused of instrumenting its geo-economic position between East Mediterranean and Europe to gain geopolitical power. Greece is positioning itself as the new gas hub in the South-eastern flank of Europe. The diversification of supply routes whether pipelines or LNG oriented helps the country to centralize gas from different regions. For the moment the need to diversify the gas supplies from Russia is at the center of EU gas policy and Greece is attracting most of EU funds in this perspective. In this perspective Greece is engaged in an economic coopetition with Turkey that could be resolved in favor of Greece by the overstretched engagement or Turkish forces in the Middle East. Yet the global issue of Mediterranean gas supplies could suffer from several issues. The first one would be an accelerated energy transition out of fossil fuels, having a direct impact on gas demand. With the rise of renewable energy sources and energy storage, gas consumption could decrease dramatically around mid-21st century. Moreover, the large number of gas related projects in the South-Eastern flank of Europe could lead to an overflow of gas to Europe and the Balkans resulting in a breakdown in revenues and in non-profitable infrastructure in Greece and Turkey. This issue is already emerging when looking at the LNG infrastructure all over the region with 3 terminals in Turkey, 2 in Greece, 1 in Croatia, 3 in Italy. Also, Greece – and South-Eastern gas projects in a broader view – could suffer from the competition of US shale gas. The US are building a large number of LNG export facilities with more than 70 Bcm of capacity added in 2020. The possible impact of decrease in LNG prices and the development of a transatlantic security of supplies policy, possibly though NATO energy security policies, would be dramatic for the Mediterranean projects as certain countries (Poland, Lithuania, etc.) have already designated the US as their future key supplier. Important resources, especially in Israel, and lower long-term prices of gas through pipelines are in favor of Greece but the geopolitical tensions over the region could ruin Athens efforts to become the center of Southern gas transit. Given the disputes on maritime boundaries but also on the future of post-ISIS Middle East, an important rise in tensions could freeze all major projects and especially gas exploitation. E. Alessandri, The New Turkish Foreign Policy and the Future of Turkey-EU Relations, Rome, IAI, February 2010. J. Alterman (dir. ), The Turkey, Russia, Iran Nexus: Evolving Power Dynamics in the Middle East, the Caucasus, and Central Asia, Washington, CSIS, November 2013. D. Auverlot (dir. ), L’Union de l’énergie, Paris, France Stratégie, August 2015. BP, Statistical review of World Energy 2017, BP, London, 2017. S. Colombo and I. Lesser, The Mediterranean Energy Scene: What Now? What Next?, Roma, IAI, April 2010. EBRD, Document of the European Bank for Reconstruction and Development: Energy Sector Strategy, as approved by the Board of Directors at its Meeting on 10 December, 2013. EIU, The Great Game for Gas in the Caspian, 2013. ENTSO-G, Southern corridor Grip 2014-2023, Brussels, 2014. A. Giamouridis and S. Paleoyannis, Security of gas supply in South-Eastern Europe, Oxford institute for energy studies, July 2011. F. Hill, Energy Empire: Oil, Gas and Russia’s Revival, The Foreign Policy Centre, September 2014. A. Honoré, « Le Moyen-Orient et le développement d'un marché mondial du gaz naturel », Politique étrangère, 2006/2 Summer, p. 269-281.
International Energy Agency, Energy in the Western Balkans, Paris, OECD, 2008.
International Energy Agency, World Energy Outlook 2017, Paris, OECD, 2017.
International Energy Agency, Energy Policies of EIA Countries: Greece, Paris, OECD, 2017. A. Kovacevic, Towards a Balkan gas hub: the interplay between pipeline gas, LNG and renewable energy in South East Europe, Oxford Institute for Energy Studies, February 2017. J. Marcou, «La Turquie en quête d’un nouveau positionnement au Moyen-Orient», Politique étrangère 2016/2 Summer, p. 63-73. N. Mazzucchi, “Les enjeux énergétiques de l’annexion de la Crimée”, Champs de Mars n°29, August 2017. N. Mazzucchi, Energie, ressources, technologies et enjeux de pouvoir, Paris, Armand Colin, 2017. A. Weiss (dir. ), Promoting International Energy Security Vol. 2, Turkey and the Caspian, Santa Monica, RAND, 2012.